It’s IoT Week at SitePoint! All week we’re publishing articles focused on the intersection of the internet and the physical world, so keep checking the IoT tag for the latest updates. After e-commerce and social media, the next big thing has arrived — internet-enabled devices, otherwise known as the “Internet of Things” — and WordPress is ready to embrace it. This revolutionary paradigm shift is set to transform every aspect of our lives, from optimizing our homes to the way we travel. Though the Internet of Things has already made its way into home automation, it hasn’t quite taken off with WordPress integration. The Internet of Things creates value from gathering data and leveraging it in real time. WordPress and the Internet of Things can work together in a sensor-to-machine relationship (where WordPress is the sensor) to increase productivity, make processes more efficient, and analyze data without employing additional, complex machinery. With this in mind, in this post, we’re going to look at the Internet of Things from a WordPress standpoint and how it will allow our websites to communicate with devices in order to make the Internet of Things WordPress-smart. Let’s put everything into context before we get started. In a nutshell, the Internet of Things (IoT) is all about connecting various devices through the Internet. The term Internet of Things itself refers to the concept of the set of Internet-enabled devices that are intelligent, connected, interactive, and autonomous. When we talk about IoT devices, the most common example that pops into mind is home automation appliances such as lightbulbs, refrigerators, toasters, and espresso machines. However, the effect of IoT is also visible in smart cities and farming. The smart devices connect with the outer world by means of a wireless connection which can be established through Wi-Fi, RFID, NFC, or even Bluetooth. Kevin Ashton is often attributed as the inventor of the term “Internet of Things”. Although we’ve only just been hearing the term for the past decade or so, the concept first originated back in the 70’s and was referred to as pervasive computing or the embedded Internet. After several tries, IoT has finally moved past all the hype and into today’s modern technological infrastructure. Nevertheless, it started out gradually with the first Internet-enabled device created in 1990 by John Romkey a year after the advent of the World Wide Web – the Internet toaster. The first IoT device was created a year before the first web page! According to IoT Analytics, the term Internet of Things was given to this revolutionary phenomenon in 1999 by Ashton with a purpose to promote RFID technology. IoT has grown rapidly in the last few years which is in part thanks to the cloud. If you’d like to know more about how IoT started out and how it took off, check out this timeline piece by Postscapes: A Brief History of the Internet of Things. You might have heard that ‘the Internet of Things is far bigger than you realize’ thrown around. But how big is it really? IDC predicts that the Internet of Things market will cross $3 trillion by 2020. According to Gartner, a typical household could potentially contain nearly 500 Internet-enabled devices by the year 2022. According to Business Insider, a total of 24 billion IoT devices is expected to be connected to the Internet by 2020 surpassing the 10 billion traditional computing devices such as smartphones, tablets, and desktop computers. The WP REST API in collaboration with WordPress’ established plugin ecosystem is essentially designed to allow real-world devices to connect with WordPress via the Internet which, in turn, allows WordPress users to connect with real-world devices. A professional blogger can set up a bell to ring every time you get a new comment on a blog post or page to reply to readers immediately. Business owners can use IoT devices with WordPress to light up every time a support ticket is received or answered to keep the staff motivated and let employees know which team members responded to the most tickets. Keep track of how many sales you’ve made in a given period of time and wave a flag when your company’s sales goals are achieved. Set your site to give you a mobile notification if your site experiences downtime so you can rectify the problem. Several different services allow webmasters to connect real-world devices with their WordPress sites. Webmasters can use these systems to integrate their website with all kinds of IoT devices. In this section, we’ll take a look at four of these services and highlight the features they offer users. littleBits consists of electronic building blocks that can be used to invent all kinds of new devices and then connect them to the Internet through the platform’s own API. The electronic building blocks are color-coded which makes them super easy to use, magnetic which makes it convenient to join with one another and reusable which saves means that you can use a set of building blocks to create several different inventions. littleBits empowers users to invent everything from smart home devices to remote controlled cars and spin rollers to doodle wizards. As of now, the littleBits library consists of 60 modules that can be connected with the others in virtually millions of different combinations so you never run out of things to invent. The best part about littleBits is that it enables users to easily create modular IoT devices very easily. Users can then automate or control these devices through the littleBits’ built-in dashboard or create custom integrations with the littleBits’ API. 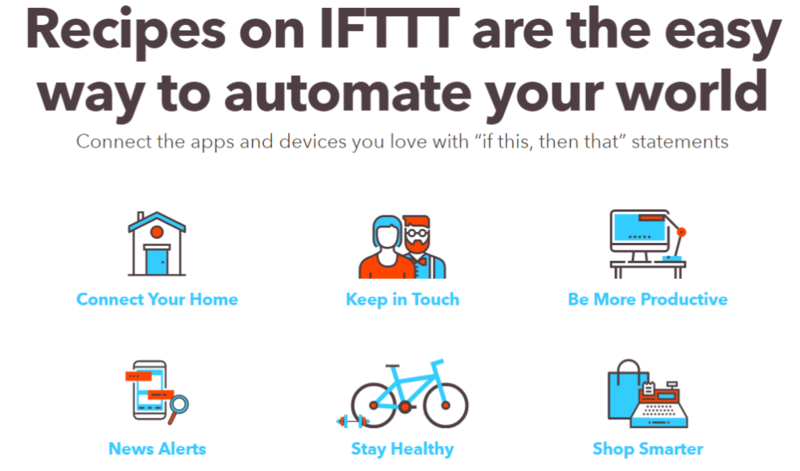 IFTTT (If This Then That) opens up many creative possibilities for inventors by empowering them to establish simple If-Then connections with apps and real-world products which they call recipes. Currently, there are two types of recipes – DO recipes and IF recipes. If I post a picture to Instagram, save the photo to Dropbox. As of now, IFTTT is compatible with 321 channels including WordPress, MailChimp, Workflow, Slack, littleBits, Particle, and 13 different social networking platforms. Here’s a complete list of the channels you can establish recipes for with IFTTT. IFTTT aggregates the channels of your choice in one place and then allows users to create recipes to integrate them to achieve a goal. Every recipe involves two web applications – one to set off the trigger and the other to perform the given action. IFTTT is incredibly easy to get started with and its intuitive interface allows users to create recipes even if they aren’t particularly programming literate. RC Lations has developed a littleBits plugin for WordPress to help webmasters get started with the platform. WordPress enables webmasters to connect their site – whether it’s free or self hosted – to IFTTT and use it as either a trigger or as an action. As of now, there are two triggers and two actions available for the IFTTT-WordPress integration. Triggers: The first trigger, Any new post, goes off every time the webmaster publishes a new post on their blog. The second one, New post with tag or category, does the same thing but allows webmasters to set off the trigger only for specific categories or tags. Actions: Create a post and Create a photo post are the two actions that webmasters can have their site perform as a result of a trigger. The former creates a simple post whereas the latter creates a photo post and links the given URL to an image. You can get started with the IFTTT-WordPress integration by connecting the service to your blog. Be sure to check out these posts on Using IFTTT With WordPress and How to Automate WordPress and Social Media with IFTTT. Particle is a popular service that enables users to transit between prototype to production and build an Internet of Things product. The service provides users with a cloud-connected hardware development kit that makes it easy to prototype their ideas. The standout feature in Particle is that the IoT devices you engineer are essentially powered by a real-time, secure, and scalable cloud platform. The service also features a premium-quality Device Management dashboard that lets you control and manage your collection of products, deploy firmware updates, gather data, and integrate them with other services. According to their website, the easiest way to get started with an IoT product is an open-source development kit. Particle has the technology in store to enables users to create their own IoT devices that are pre-loaded with the firmware libraries and connected to the cloud. Particle’s SparkCore plugin for WordPress enables webmasters to directly send requests to their Spark Cores by setting the Access Token, Core ID, and API URL. These are some of the most popular services out there that allow WordPress users to integrate their website with IoT devices in order to deliver more value. The WordPress REST API allows users to integrate web applications and platforms with WordPress to build integrated systems, tailored solutions, and, of course, IoT applications. Now that part of the WordPress REST API is merged into the WordPress core, it makes it easy to facilitate device-to-device communication with Open Source APIs and protocols. The WordPress REST API fits perfectly into this new era of the integration of Internet-enabled devices with WordPress by allowing web developers to establish a direct communication pathway to transmit and receive data. wpForGlass, the brainchild of Weber Shandwick’s digital innovation team, is one of the earliest IoT implementations for WordPress that was developed exclusively to work with Google Glass. This plugin allows webmasters to post directly to their WordPress site from their Google Glass. Be sure to check out this video which illustrates how wpForGlass works. The plugin works by employing Google’s Mirror API and allows users to post photos and videos taken with Google Glass directly to their blog. Setting up this plugin requires some technical knowledge to configure the relevant Google Mirror API. Nike+ is a WordPress plugin that focuses on health by letting you keep track of your running process and then displaying them on your website – complete with widgets and shortcodes. The plugin was designed to work with both individuals or team sites. Although the plugin hasn’t received updates in the past few years, Nike+ was one of the very first IoT implementations developed for WordPress sites. In the near future, most of our devices will be connected to the Internet. Popular services make it possible for WordPress webmasters to get started with the Internet of Things right away. We encourage you to try them out for yourself and see which one works best for you. What would you create with an IoT-WordPress pairing? Let us know by commenting below!